This blog will be the first part in a look at Jersey's only paper, the Jersey Evening Post. I will not be looking at the obvious biased coverage that the paper gave to its preferred candidate, Sir Philip Bailhache during the whole of the Senatorial Elections, last month, nor the lack of balanced reporting (not yet). Today, I am simply doing in this post is putting up a copy of the letter I sent to the editor, Chris Bright, yesterday complaining about repeated inaccurate reporting from his paper, which is either down to staff incompetence or institutional bias. I am compelled to publish it here as I doubt it will see the light of day in his paper. I will expand more on the circumstances and Mr Bright's attempt to threaten me in the next post, but for now, here is the letter. I am obliged to write to you to correct an inaccuracy in yesterday’s JEP by your political correspondent Lucy Mason. Your reporter stated incorrectly that I had ‘admitted spoiling [my] paper in the third round [for the election of Privileges and Procedures Chairman].’ This is untrue. Firstly, I admitted no such thing and secondly, I did not spoil my paper (I am happy to confirm that I voted for the winner). This is by no means the first time that your political correspondents have misrepresented me. Only three weeks ago (2nd November), I was given a written apology by another of your political correspondents, Toby Chiang, following a curious report in the fly which said I was wearing a ‘badge’ that was either a Sheriff’s badge or some left over from a Halloween costume. 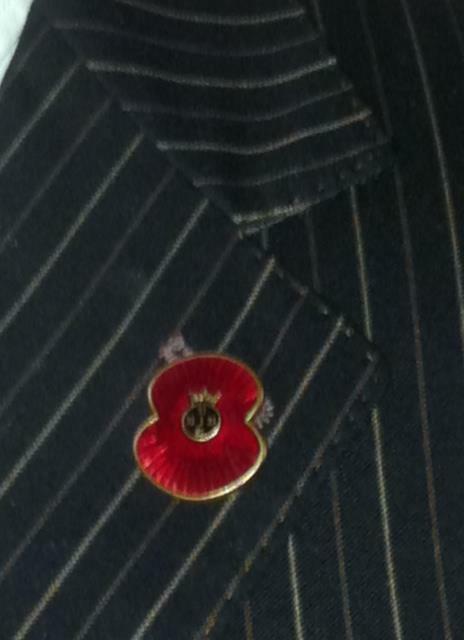 It was in fact the Royal British Legion enamel poppy, which was also being worn as a sign of respect by a number of my colleagues. Why I was singled out for misreporting, I have no idea. I would ask that in future, such errors are avoided, as intentional or not, they have the effect of conveying a false impression which is all too easily picked up upon by those who would seek to disparage the valid work which any political representative legitimately seeks to undertake. Moreover, I would like to take this opportunity to register my disappointment at the coverage which the Ministerial and Chairmen’s elections have received in your paper. Apart from the Chief Minister’s election, no coverage was given other candidates who did not manage to secure positions, even though their speeches and the questions which followed were equally relevant and sometimes better than those of the successful candidates. It seems to me that rather than making up words and attributing them falsely to States Members, your reporters would do better to actually report on what was said, or else get out of the business of journalism altogether. I don't know why you bother. The JEP have been off the rails even before you've been around. Vfc & Rico are blowing these muppets out of the water. As a politician what can you do about it. As the saying goes "you couldn't make it up" but clearly the JEP do. Credit to you for having the courage to speak out and expose this lot because they, being the only "News"paper on the island, have the power to destroy your political career. Thankfully Politicians like yourself, and a growing number of others, do not feel as intimidated by this paper as they did before the internet (Blogs). "Tomorrow: Chris Bright's defensive and threatening response." That's very interesting, and in particular, the "threatening" bit as I have seen a letter from Chris Bright to another politician that could be read as a threat also. If you are up for an interview on the subject of "State Media" let me know. In the meantime check THIS out. Brilliant, can't wait for the response! I wrote to Chris Bright myself about the apalling media coverage & utter discontempt for victims. The reply I got back from him was astonishing, it was rude, threatning and made to feel we were something disgusting on the bottom of he's shoe, this was shown to people who were utterly disgusted for the Editor of our only paper to treat people in this way, so how are we ever to get the real truth out there when we have people like that in charge of what gets written. Mcrandle should stick to trying to 13th step young women in the rooms. I think this is wonderful. Newspapers are supposed to report facts, not make things up and play nasty political cheap tricks. The "Penthouse" regular at Raffles Disco reknowned for outrageous cavorting behaviour under the influence of "legal & otherwise subtances" so ideal CV for the "Rag" member of staff!!! The misreporting you have delineated is relatively minor, though irritating. Another example that is also relatively minor (but irritates me) is the JEP's tendency to describe the incinerator as a waste to energy plant or an energy from waste plant. Leaving aside environmental considerations about how this description falsely greenwashes the public perception as to whether we are handling our waste properly (we are not), I have several times attempted to correct JEP staff, particularly Harry MacScandal, as he is known in the trade, that the incinerator should not be described as they do because incinerators of this size cannot be thermodynamically efficient enough to be thus described under EU regulations. Under these (unless they have changed recently) what we have at the gateway to Jersey is an architecturally designed disposal plant. With incinerators the bigger the better, efficiency wise. To be described accurately as an EU compliant energy from waste plant, the incinerator would have had to be capable of burning at least 200,000 tonnes per year. As it was sized to burn not much more than 100,000 tonnes per year, it is just too small to be efficient enough to be described as they do. When I emailed Harry M about this he didn't say "oh sorry, didn't know, won't do it again" or some such, he actually told me I was obsessed. He has continued to falsely describe the incinerator, as have most other JEP reporters who mention it since. Now, as I mentioned at the beginning, this one thing is not significant but one can extrapolate the JEP's corporate attitude from it - and that is significant. From my own experience with the medium over many years, I think the JEP swings from investigative journalism to highly biased political promotion/cover up, from fair and straight to biased and misleading. It seems to change with the wind! I still buy it and I still rate it over CTV. I think financially they are probably struggling and I wouldn't like to see them close but sometimes they can be a pain and I think this happens when editorial policy gets a bit too heavy-handed. Methinks they listen to Ozoufspeak too much, as in 'White is Black if the light is switched off!'. I remember a glorious non JEP moment some years ago when I caught TTS dumping mixed top and bottom ash at La Saline Quarry, on the north coast, totally and utterly illegally. the JEP wouldn't do anything but another paper of the time (name eludes me (old age)) even printed my photos. Along with Professor' Mulreadys' comment that it had only happened that day as an emergency. Regretfully for him a load of daffodils had pushed through the ash and flowered!!! Good luck with your campaign on journalistic standards Monty but the JEP is not our only newspaper of course. As in the UK there are many other "national" newspapers for Jersey. Unfortunately the Jersey public does not quite manage to put the JEP into its correct local slot. The Daily Mail is just as important in forming views in Jersey as is the output from Five Oaks. I don't know what views arise from Polish or Portuguese journals but we should not over-estimate the importance of the JEP for the whole 92,000 residents. For some it is the bible - for others it is simply the stuff for the hamster's cage. On the other hand - the regulation of all British newspapers is currently the subject for much discussion in London and bodies such as the Press Complaints Commission will soon be totally reformed - if they exist at all. Such reforms will apply as much to the supervision and regulation of the JEP as they will for the Daily Mail - so the current dicussions (not taking place in Jersey of course) will have immense implications for the media and its relationship with the public. In Jersey as you well know, most of our recent governmental activity has been concerned with trying to stifle bloggers or diminish access to information. What impact the UK reforms might have on internet activity is not at all clear but we can all be assured that the JEP will be subject to a wholly reformed regime of control soon. What do you think your fellow States Members will make of that? This is interesting, talking about about Harry McRandle. He is Chief Operation Officer of FlyOnTheWall. I see Gordon Brown was at this event, and I wrote to him many times about child abuse in Pindown and the secret family courts. I would have loved to have been invited to this, because I would have loved to talk about the things I wrote to Gordon Brown about. Toby Chiang is just a kid! Perhaps he should stick to playing with Plastercine rather than trying to pretend to being a political correspondant. Monty as the 'progressive' with the most votes at the last election you become the de facto target for these campaigns. I am delighted to see that they have started their campaign of misinformation against me once more in today's JEP. You need to get the Jersey Gazette removed from the JEP. With the £277,000 that the States spend in the JEP you realise you could get a door to door delivery once per week of a Jersey Gazette which would include all the pertinent information that is included in the JEP. Think expenditure savings... you could be a right wing hero! Come on Monty you told us you would be publishing the threatening email you got from Chris Bright!? Sorry for the delay in posting. I have been busy all day - at the Council for Culture and with a planning application this evening. The Gazette information could be published online for peanuts, and on the walls at parish halls for those who don't do computers - sorted. Interestingly, I think you would be surprised by how widely your views are shared by people from all political spectrums. The JEP's monopoly of the supply of written content to most Jersey people (who believe it to be independent and unbiased) is wrong. The JEP are quick to criticise the abuse of power but in fact the most powerful man in Jersey is Chris Bright. He directed the results of the last election. He decided Sir Philip should top the poll, that Stuart Syvret should be rejected and that Freddie Cohen should be punished. His reporters delivered for him. He also directs the tone in Jersey - always siding on the Daily Mail view. Compare the JEP with the Guernsey Press - same ownership but completely different approach. He spreads misery because he is grey and miserable not bright. The States, Parishes and all States companies should be required not to spend money with the JEP - everything should be online. The Competition Authority should review their abuse of their dominant position. The States should launch an enquiry into the JEP - the evidence would surprise many. To Anon ref our comment "The States should launch an enquiry into the JEP"
As the States needs\uses the JEP to massage public opinion I do not think that the States would want to investigate the JEP. Even with a favourable set of terms of reference and a 'sympathetic' investigator there would be a chance of something slipping out; or at the very least, the raising of the symbiotic relationship to the masses who may start to ask awkward questions. I do like the idea of a monthly newsletter along with notices published within Parish halls. This could save the States (aka 'us' the tax payers) a small fortune. This would reduce the amount of money entering the JEP but to be brutally honest, I don't actually care.